When using the BlackFog on Google Chrome for Windows you may notice that not all advertising and data collection is blocked. While BlackFog will block 90% or more, some advertising and data collection may still be possible. Recent versions of Google Chrome employ a feature called Async DNS. This feature bypasses the normal operating system mechanisms for resolving domain names and uses the browser directly. In this mode, DNS requests will uses SSL to communicate directly with Googles own DNS servers and some third party providers. As a result you may see some Ads leak through the browser. To disable this feature and provide 100% coverage you can disable Async DNS by changing the shortcut to Chrome within Windows. 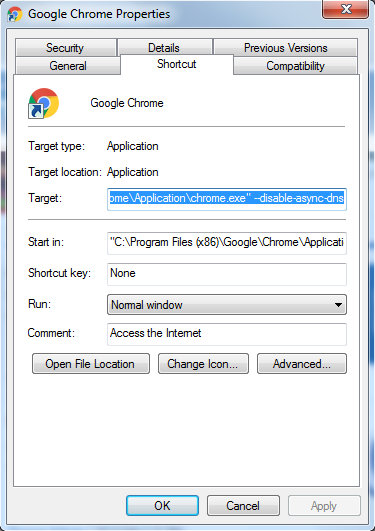 Edit the properties of Google Chrome and append “–disable-async-dns” to Target as shown below. Now start Chrome from this shortcut. You will now be using the normal DNS resolution and should see that all Ads and Data collection activity has been stopped.